What happens if the Study is positive? IF the results of the test indicate you do have OSA, you will need to initiate a readily available therapy for the condition. The most prevalent and proven Therapy for OSA is a respiratory therapy called Continuous Positive Airway Pressure (CPAP). CPAP is a small machine that provides a flow of air through a tube connected to a mask that you breathe through at night. There are many options available to help you find a CPAP that works for you, and the machines have become increasingly smaller, more portable and convenient for use even with ways to use them in your bunk while overnighting on the road. CPAP Machines are only available upon prescription and are obtained through companies that handle Durable Medical Equipment (DME). 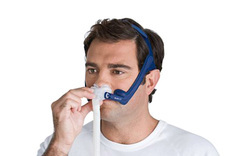 While we are prohibited by law from providing CPAP therapy ourselves, we can help you find a resource in your area that can get you started with a machine and mask combination that work best for you. It is important to work closely with your DME company to find a solution that works for you as compliance with the therapy is tracked during its use and will be required in order to meet the criteria to obtain and maintain your CDL medical card. Your medical examiner will need to see the reports generated by your CPAP machine that show how often and for how long you use the CPAP therapy. Compliance is considered to be more than 4 hours of use, on at least 70% of the nights in a given period. If your data shows you are not using the therapy at least this often, your medical card will likely be revoked until you establish compliance. There are other therapies, treatments and lifestyle changes that may benefit you. The best course of action is to find a Physician knowledgable about OSA to provide a thorough evaluation and develop a treatment plan suited to your situation. Many medical disciplines contain physicians that treat OSA including ENT (Ear, Nose & Throat), Pulmonary, Oral/Maxillofacial, Dental and other. A list of such physicians may be found through the Physician Finder section of our home company's webpage. Lifestyle changes such as weight loss, eliminating alcohol and smoking, and improving muscle tone can be very beneficial. There are surgical procedures, both outpatient office-based procedures and more aggressive option OR based procedures which surgeons trained in OSA can perform for you. Oral Appliances, such as the SomnoGuard AP, have been proven to be effective for many patients, but do not currently have the ability to document compliance with use, even if effective, and their use should be coordinated closely with the guidance of your Medical Examiner.